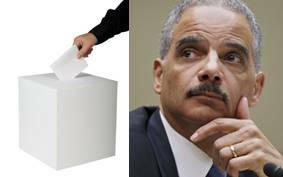 Texas voter ID law will go on trial this week before federal court in Washington, D.C. InTexas v. Attorney General Eric Holder, Texas asks the court to approve the voter ID law passed by the legislature last year. Many Democrats are claiming the voter ID law, which will require voters to show a state-issued ID at polls, is discriminatory and disenfranchises thousands of legal Texas voters who don’t have a state-issued drivers license or ID. Honestly, it is puzzling how this became a partisan issue. How can one operate in our society without a photo ID? Photo IDs are required to board an airplane, drive a car, and open a bank account and cash a check. Anyone driving a car to a polling location is required by law to have a state-issued drivers license, so anyone not taking public transportation, walking or being driven to a polling site has no argument against the voter ID law. However, a photo ID is also required to apply for welfare and food stamps and purchase alcohol and cigarettes. Try to find a single Texas adult who doesn’t do any of these things and actually votes on a regular basis. The individuals who this law adversely affects are illegal immigrants and the deceased, neither of which should be voting. Yes, a state-issued drivers license or ID requires a small processing fee. For those who don’t drive and are under 60 years old, this fee is $16. While this may seem like a large sum for someone out of work and struggling to make ends meet, this ID lasts for six years, making the yearly cost come to under $3. For those over 60 years old, there is a $6 fee for an ID card with an indefinite expiration date. Are these the fees that Democrats claim will disenfranchise thousands of voters if voter ID law is upheld in Texas? With the right to vote comes a certain civic responsibility. No one enjoys standing in line at DPS to take an unflattering picture, but to say this is something only an elite group of Americans have access to is absurd.